Rain falls as I pack my tent. It’s early, before dawn, but I’m too close to civilization and not quite hidden. Farmers get up before the sun. I can already hear a tractor rumbling in the distance. Water drips off the tent’s fabric as I roll it. I hope the rain breaks as it’s supposed to. I’ll need to hang the tent off my pack to dry if I get a bit of sun. Otherwise tonight will be, well, actually, otherwise I guess it won’t matter really, not now, not anymore. Clouds swirl around the low hills. The cold air is thick with humidity. Sweat doesn’t dry. It sticks to my clothes. The fabric turns paper thin in the wind. Is it even there? I walk into warmth, the heat of my body’s muscles pushing back against the damp, cold air, fighting to an uneasy draw somewhere around the surface of my skin. How many times have I played this same game? Put on more clothes and I’ll soak in sweat. Stop walking and numbness will crawl from my fingertips up my hands. But I don’t have to stop walking. Not anymore. I can walk from sunrise into the night if I want to. I rise up into the hills. Sheep farms cover the lowlands, their pastures stretching up the slopes. Through the fog and clouds, I catch glimpses of their herds, tiny white flecks on the green grass. It’s quiet on the paths and roads. A farmer here and there, a passing car, but mostly quiet, mostly just fog and thoughts and mud. The clouds drift in and out. The world feels distant, even the ground under my feet, like I’m watching it in a dream. I cross a pass, drop down into a valley of farms, then rise up to another pass. In the distance I see Saint Jean Pied du Port nestled in a valley. I meet a herd of cattle coming down the pass. They stare at me as I walk by. There is no fence between us, a farmer is moving then between fields, herding them from his tractor with the help of two dogs. I wave at him, but stare at the cows. They are bigger when there is no fence. I wonder how fast I could be over the barbed wire stretching from post to past next to the road. I think it would be fast. Maybe fast enough. I reach the valley floor and find a trail junction. I think it’s the trail I abandoned for the Pyrenees foothills. It doesn’t hold a grudge and we continue on together. Signs start pointing to Saint Jean. I pass a small village, pass farms, a few old churches, then I see a castle on a hill, a wall stretched over the road, a gate. Something flares up in my memory. 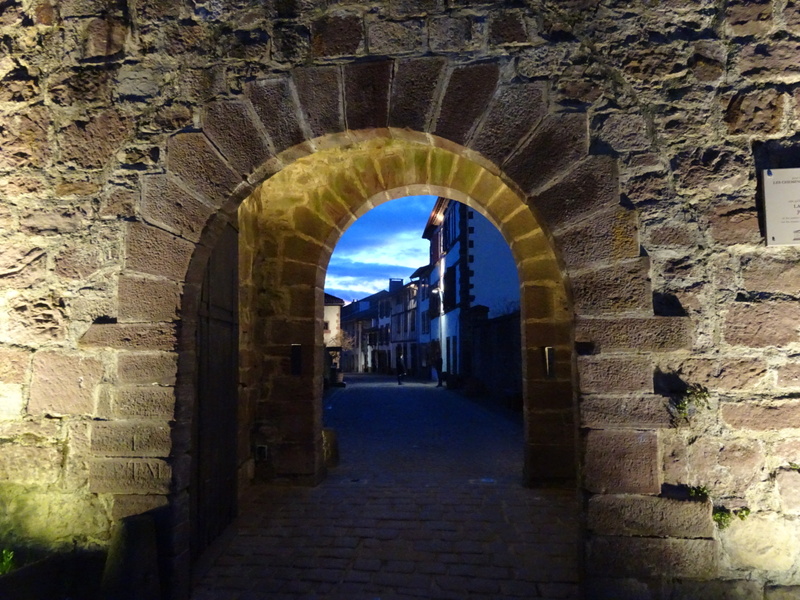 A wall with a gate, the start of the journey for pilgrims along the Camino Frances. Is this it? No one is there, but a sign tells me I am right. I stand alone for a moment taking pictures. Then a kid comes rushing through, his family behind him. I smile at them and they pass. I take a few small steps through. Two women with backpacks walk by. I stare at them, wide-eyed. They are walking too. I follow them to the pilgrims office. I need a credential to prove my journey to Santiago. The aches in my feet, the thickness of my thighs is not enough. I sit down and talk to the people there. They point me to an albergue to stay for the night. They give me a list of all the places to stay from here to Santiago. I check into the dorm room to reserve a bed. Then I wander outside to a small park. I pull my soaked tent out of my pack, then my sleeping bag, all the damp, ragged gear and lay it out to dry. The tent hangs on an old castle wall. The sleeping bag over a bench, my clothes in the grass. I sit there with my drying gear, the pieces of fabric, plastic, and metal that I trusted my life to in the Arctic Circle, that carried me across the Alps in winter, that kept me alive against anything the world could throw at me. Some are ripped and sewn back together. Some are bent. We all show scars. I sit, tension draining out of me, sadness filling the empty space. Me eyes run across the gear scattered around me like pieces of armor after a battle. I don’t need it anymore. The insanity is over. I am on a well-trod path now. It is the end and a beginning all in one. Joy and sadness. A smile and a frown. I remember the lonely, hard days, in the moments of dispair and frustration, when I knew that if I just reached the Camino, everything would ease. Winter would lose its power. Rain would be reduced to a nuisance. I’d meet people walking every single day. It seems so fast and so long coming at the same time. I run my fingers over the fabric of my tent, checking for the last traces of rain. It’s gone. I roll the fabric over the poles. I pack things away one by one, each in their places. I’ll find a post office soon, maybe a day or two, and they’ll disappear. I walk back into the albergue. It’s warm inside. Three pilgrims are talking together at a table. Tomorrow they’ll take their first steps toward Santiago. The air is a flood of emotions, nervous tension, uncertainty, excitement and anticipation, doubt and hope. I smile and wave. I throw my pack down by my cot. I hide my tears behind a hello. For the first time, I know this trail will end. Posted in Europe North to SouthTagged Camino, Camino Frances, ENS, Europe North to South, featured, FranceBookmark the permalink. I don’t want it to end, either. Your daily post has become as necessary as my morning coffee. Not much longer but I am hanging on every step. When is next video? Superb D. Thank you for letting us into the sanctuary of your mind. Thank you for this wonderful post. Cannot imagine how good that must have felt! Hi. I am a bit confused and tried to find out yesterday just what your plan was for this wonderful journey. Was your plan to end it at Santiago? That will be a fitting stopping place. I had just thought that you would be going to the end of Spain, like Gibraltar, as you started at the northern tip of Norway. Regardless, I have enjoyed ALL of what you send and appreciate your hardships and discoveries. Daniel, our dear friend, greetings from Cape Coral, FL. So grateful for what you are sharing in such graphic words and images. Ah! The yin and yang of it all! Thank you for sharing what this felt like for you having reached the beginning point of the “official” Camino, having come so far on your own independent Camino. Congratulations! Another significant and emotional milestone accomplished on your long journey. Just like crossing the Arctic Circle, taking the ferry to Denmark, leaving Germany and crossing into Switzerland and over the Alps. Each milestone brought you closer to achieving your dream of Europe N to S. Namaste. What a wonderful post. Took right there, all the mixed feelings, the changes, the trials, and this last part of this journey coming up. My heart is with you Daniel.